Ostrich and Lark spend their days on the grasslands of southern Africa surrounded by a chorus of birdsong. From his perch in a tree Lark joins the chorus, while below Ostrich is silent. Then comes the joyful day when Ostrich finds his voice. 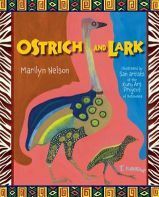 This picture book about an unlikely friendship is the result of collaboration between the award-winning poet Marilyn Nelson and the San artists of Botswana. part lion’s roar, part foghorn, part old man trumpeting into his handkerchief. ” In fact , ostrich boomed so loud that lark fell off his branch. It is a simple story told in delightful, poetic language sure to engage its readers. Equally engaging and captivating are the brilliant, exuberant drawings illustrating each page of the story. These drawings are unique for several reasons. They are the collective work of a number of artists from the Kuru Art Project located in the Kalahari desert in the northwestern part of Botswana. The hot palette of these paintings are almost like those of Fauve artists who favored bright, vivid colors over more realistic tones. Matisse was a well-known Fauve artist. The artists are all San, formerly referred to as Bushman. These San, however, prefer their own name, specifically Naro San, as opposed to a name given them by outsiders/colonialists. Each painting illustrating a different part of the story is signed by the artist who created it. These artists depict the environment of the desert including insects, birds, trees, anthills, thorn trees, the brilliant sun and the dusk of evening in vivid fields of blues, oranges, greens, yellows and animated with dots and stripes, strong outlines and organic patterns. Among the many wonderful children’s books about Africa available to an American audience, they are rarely illustrated by Africans. A few come to mind, such as Meshack Asare from Ghana, Niki Daly from South Africa, and Abebe Kassaye from Ethiopia. This makes Ostrich and Lark rare and special for the artists are the indigenous San people from Botswana. The Kuru Art Project, part of the Kuru Development Trust, came about as the result of the efforts of Willemien and Braam le Roux in 1990 to assist San people to become more independent and to earn income. San peoples had been forcibly removed from their historic lands at the beginning of the twentieth century with the promise that they would receive government assistance and compensation. However, neither happened and the San peoples have had to struggle for survival. The Kuru Art Project was one effort to provide San people opportunities to explore their artistic potential. As an initial step to encourage their creativity, San people were taken to the north – western part of Botswana and shown the historic rock art of the Tsodilo Hills which date back thousands of years. This experience provided the participants inspiration to explore fauna and floral themes first in their textiles designs and then in paintings on canvas. The men and women artists who contributed to Ostrich and Lark are Cgoma Simon, Gamnqoa Kukama, Jan Tcega, Ogõcgai Cao, Thamae Kaashe, and Xgoac’o Xare (Qhaqhoo). In addition to being published artists in Ostrich and Lark artists from the Kuru Art Project have also been exhibited in the National Museum of Botswana and in museum and galleries in Zimbabwe, South Africa, Britain, Denmark, Finland, the Netherlands, Poland, Germany, Sweden, Australia, Switzerland , Japan and the United States. Like the Aboriginal artists of Australia, and the Inuit of Alaska, the San artists are slowly gaining international recognition for their contemporary artistic achievements. This book is highly recommended, not just for younger audiences, but also for older readers as an introduction to the rich artistic African heritage.